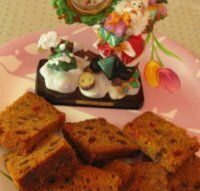 This Christmas cake / rum cake / fruit cake is a delight for everyone. It adds to the already high spirit and joy of Christmas. Although there is no reason for you to bake this only during Christmas season. It is a fruit cake which is welcomed any time of the year. If you prefer not to use rum, then you can proceed with the recipe as it is, without rum. In certain parts of the world it is very difficult to find brown sugar or muscavado sugar (which gives the color and flavor to the cake). To replace that sugar this homemade cake recipe uses homemade caramel. The recipe for which is given below. I will repeat myself, in case you are wondering 'why is she putting caramel in a Christmas cake?'. I will tell you why. In certain places where dark brown sugar is not available, the color of the Christmas cake comes from this caramel. If you have access to dark brown sugar then please substitute the sugar and caramel by 300g dark brown sugar and proceed with the recipe. Selection of fruits is a matter of choice. 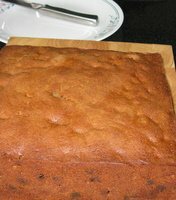 In fact in certain Christmas cake recipes the amount of fruits is more than 500g but I like this recipe as it feels you are eating a cake and not just fruits. I do not use any almond paste either to decorate the cake. You by all means can do that if you prefer. Except the raisins and sultanas, chop the rest of the ingredients into small pieces. Place the fruits in a clean bowl and mix well. Either get your hands dirty or use wooden spoons but mix well. Now pour the rum on top, till all the fruits have almost submerged in rum. Place all this in a air tight container or jar or bottle and leave for at least a month. You can store this fruit inside a refrigerator for up to an year. In a heavy bottom pan put 2-3 Tbsp of water and add the sugar. On a medium heat, melt the sugar. Don't stir it initially as it may crystallize. Instead shake the pan. When it starts to melt then you can use a spoon to stir it. When completely melted, reduce the heat and almost constantly stir, so that it doesn't burn. When it becomes of dark brown color. Remove from heat and gradually add the hot water (cautiously as it will bubble up and spatter). Briskly stir and put this back on the heat. Give it a boil and turn the heat off. Please use a big pan for this or else the sugar may boil over. The boiling point of sugar is very high so even if you take it off the heat it will pour over if the saucepan is not big enough. And if that happens it is a unwanted mess. Also do not let the melted sugar come in contact with your skin. It will be very hot. Lastly, do not add the water all at once. Add it very slowly. The best way to do this is in a stand mixer or by using an electric hand mixer. All the ingredients should be at room temperature, so remove them from the refrigerator well in advance. Sift together all the dry ingredients (flour, baking powder and all spice powder) and keep aside. To the fruits add 3-4 Tbsp of flour, shake well and keep aside (this is so that the fruits don't sink to the bottom of the cake). Cream the butter and sugar until hold peaks. Add one egg at a time and when that mixes well add the other.Add the vanilla extract and caramel. Beat till all mixes well. To this add half the flour and fold well. Now add half the fruits and fold gently. Repeat. Once all the mixture is nicely folded, pour in a lined cake tin (9" x 9") and bake in a preheated oven at 160°C for 1-3/4 hours to 2 hours. You can take the cake out after 1 hour 30 minutes to check if it's done by inserting a skewer or knife at the center of the cake. If it doesn't come out clean put it back in. Once done , Let it cool in the tin itself. When nearly cooled down. Pour 75-100ml of rum on it (use a pastry brush to evenly spread the rum). Let it come to room temperature. Place it in the refrigerator overnight (nicely cling wrapped, to avoid any odor). Slice it in the morning. Enjoy the fruit of your labor!! !